During the last couple of decades or so, mergers and acquisitions (M&As) have assumed great importance. Giant corporations and big multinational enterprises (MNEs) are constantly on the lookout for acquiring big or small companies to increase their wealth and become even bigger global giants. It is in this context that a comprehensive book on M & As such as the one authored by Professor Kamal Ghosh Ray becomes so significant. This well-balanced and well-researched text is a harmonious blend of theoretical concepts and practical aspects on mergers and acquisitions. The book begins with an analysis of the causes of and strategic approaches to M & As. Then it goes on to give a detailed discussion on the valuation aspects—valuing the enterprise, business, brands, goodwill, HR and customer relationships, valuing synergy, valuing of private sector companies and family business besides dealing with business valuation standards in USA and India. 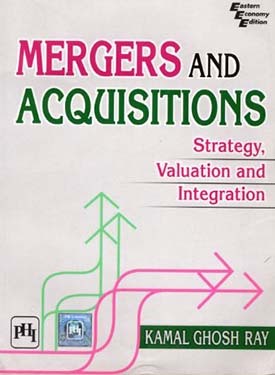 Finally, the book concludes with a comprehensive coverage of accounting for the legal aspects of and integration in mergers and acquisitions. The text is profusely illustrated with examples, tables and case studies. Intended as a text for PG students of management, this book would also be of immense value to students of chartered accountancy, cost accountancy and company secretaryship. In addition, it would appeal to a broad spectrum of professionals ranging from strategic planners, CFOs, CEOs, COOs, financial analysts, bankers, venture capitalists, to portfolio managers and entrepreneurs. Finally, the book would be treasured by anyone who is interested in Mergers and Acquisitions—an increasingly topical subject.